The city introduces itself to you, Montego Bay, Jamaica’s unofficial visitors’ lounge greets you with promises of pleasure. 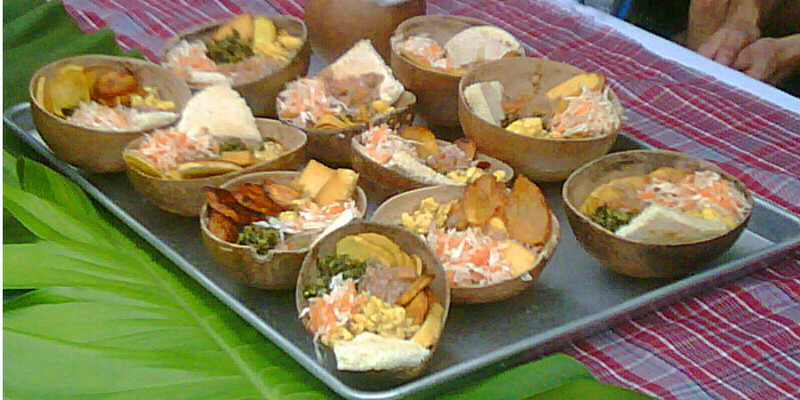 Much to see, feel, taste…mmm, the Jamaica Discovery Food Tour has officially begun. The lush land and idyllic breeze embrace. The mountainous beach town that is Montego Bay, is bordered by turquoise sea and softly reverberates reggae rhythms, displaying island art and fine cuisine; a true feast for the senses. Check in at your hotel and experience hospitality at its finest. There are no planned activities until the welcome meeting with your Tour Leader and other group members – the Hotel front desk will inform you of the meeting time and location. The tour kicks off as you visit prize-winning Croyden Estate, nestled in the foothills of the Catadupa Mountains. View and tour the historic plantation, a magnificent ode to yesteryear. This site has produced a son of the land, Samuel Sharpe, a national hero. A leisure walk, a quarter of a mile maybe, takes you through the gently sloping landscape. Many stops along the way will allow you to be swept away by the extraordinary panoramic view. 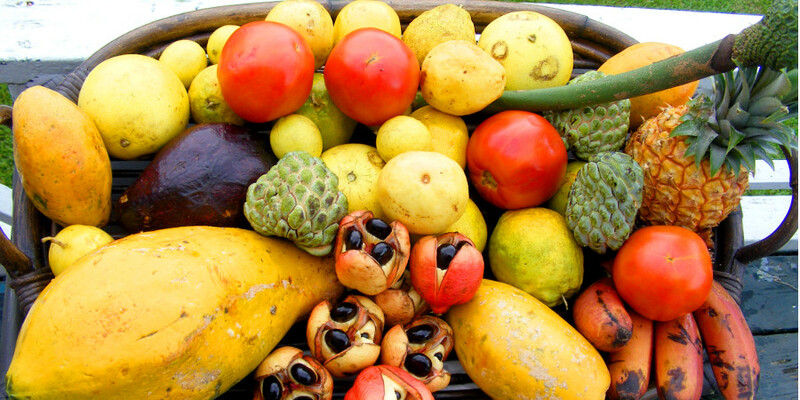 Sample Jamaican bites, fruits, local appetizers, as you walk through coffee groves. 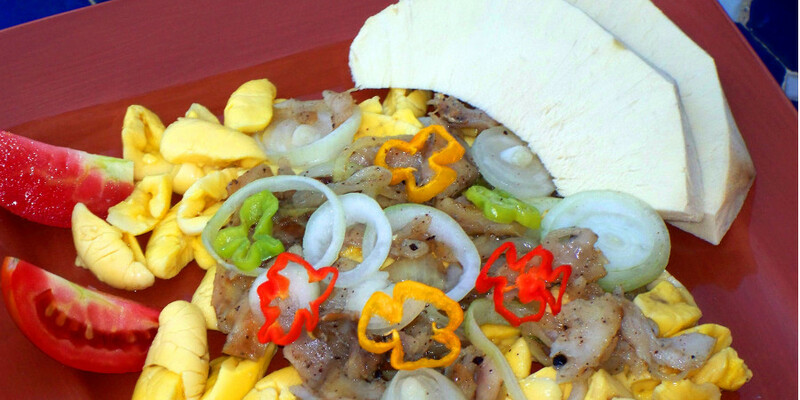 Indulge your cosmopolitan pallet with a Jamaican lunch awaiting at the end of the tour. 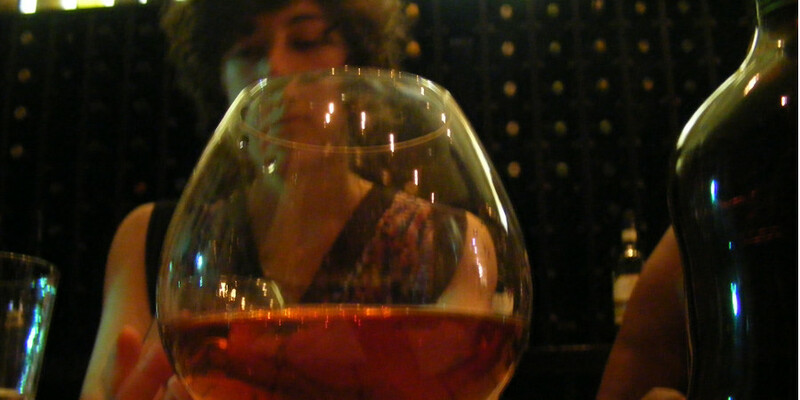 The night offers time in the city, dining in fine style in the town. The Rastafarians comprise a group of indigenous Jamaicans. Known by their ‘dreadlocked’ hair and curious philosophies, they also have an interesting outtake on the culinary arts. Famous for all-natural gourmet creations, they expertly combine foods, preserving nutritional value and especially promoting low sodium, without sacrificing taste. 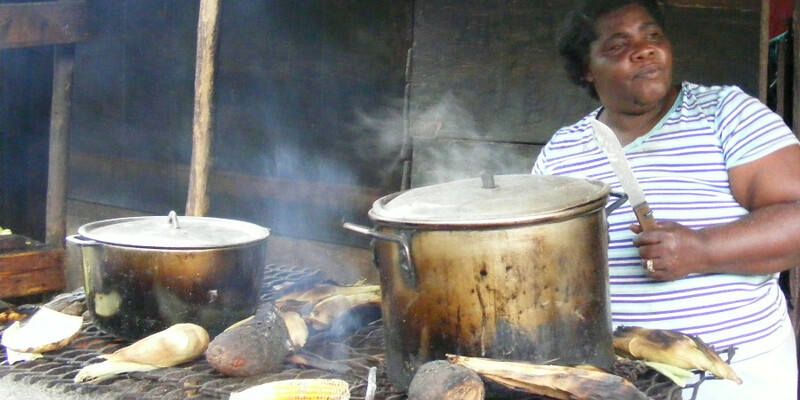 Coined and branded ital cooking, the Rastafarians own this cooking method. As noted vegetarians, they preserve animal life and instead indulge in products of the plant kingdom. The Rastafarians will reveal the secrets of their herbal garden and entertain you with mystical rhythms of their drums. Come, enjoy a Rasta reverie! 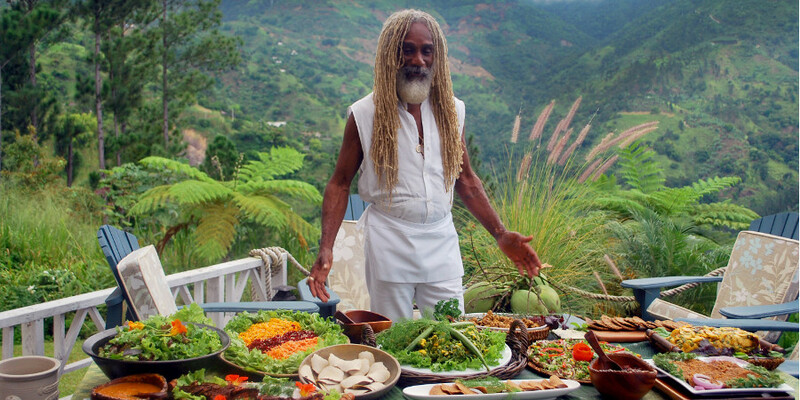 Lazily lounge as a son of Ras Tafari whips up lunch ital-style at the Rastafarian Indigenous Village. The evening allows for another incredible dining out opportunity. Today you’ll board a boat and chart a course to our fish and shrimp pots (traps) to secure the protein for tomorrow’s lunch…Keep an eye out for the playful Treasure Beach Dolphins who are always eager to put on a show for the Jamaica Discovery visitors. You’ll venture from the Caribbean Sea and journey up the Black River to see the Jamaican Crocodile and the numerous species of birds native to this area. Up the river you’ll dock on the bank where you’ll have a traditional Jamaican lunch and a swim. After Safari, you’ll leave the river and chart a course for Pelican Bar, a location like no other; a thatch-roofed hedonist haven. This quaint island-in-the-sea lounge is on a sand bar about 15 minutes off shore and is like nothing you’ve ever seen. Picture a mass of driftwood, nailed together to create a basic structure, covered by a palm thatch roof and supported by stilts, sitting on a sandbar in the middle of the ocean – this is Floyd’s Pelican Bar. At Pelican Bar, swim, sunbathe and enjoy a few cold beers and the lazy sun-drenched vibe…update your definition of paradise! Today you’ll cook Jamaican. First you’ll gather spices from the farm; onions, escallions, thyme, to name a few. Your senses will be treated to an aromatic experience as the sight, smell and feel of the herbs awaken you. 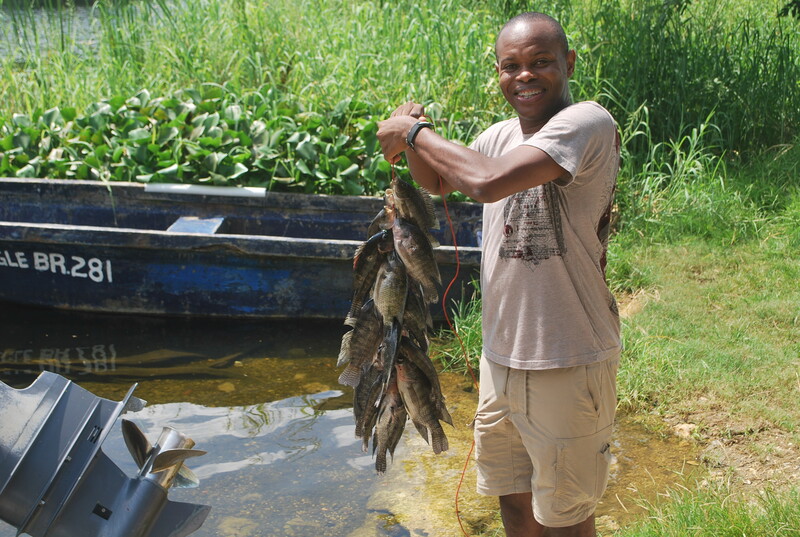 Then you, chef in the making, will prepare yesterday’s catch, under the instruction of a local chef. The choice is yours, make your fish steamed, brown-stewed or, the true pros go escoveitched; a local original involving frying and steeping in a marinade like no other. Now you’ll own official bragging rights to a significant input in your Jamaican vacation. Later, experience YS Falls, an intimate cascade, therapeutic in sights and sounds. Bathe in the sparkling waters, a renewing experience. Jamaica’s history showcases an indigenous people, slaves who had run away from plantations to the mountains, the Maroons. A tribe that epitomizes strength, the evolution of the island has left them culturally unscathed. Indeed they have proven fittest through survival. Overlooking the Appleton Estate sits a prime Maroon colony: Accompong Town. This settlement provides a throwback in time. Experience the Maroons, hear their stories, enter their world, be a part of the Medicine Man’s audience as he speaks of curious native cures boasting centuries-old potency. Then sit at the table as a Maroon feast is spread, a cornucopia of indigenous indulgences. Culture is indeed served! After lunching with the Maroons, we’ll move to “lift your spirits” with a tour of Appleton Estate. The Appleton Estate first distilled rum in 1749. See sugar cane become magically transformed into Jamaica’s Premium Rums. Learn how this luscious liquor goes from sugarcane, to molasses, then sugar, and finally becomes Rum. Sample blends for age, taste and strength, then pick up a bottle (or two) to take home. CAUTION: this tour ends with you being given access to the bar where you are allowed to serve yourself! Your rewarding sample will leave a promising tingle. Today puts Kingston at the top of the menu. The island’s capital buzzes with business and pleasure opportunities. Here the cuisine runs the cosmopolitan gamut. But not so fast before getting to Kingston we’ll stop for lunch at the spot reputed to have the very best curried Goat in Jamaica! 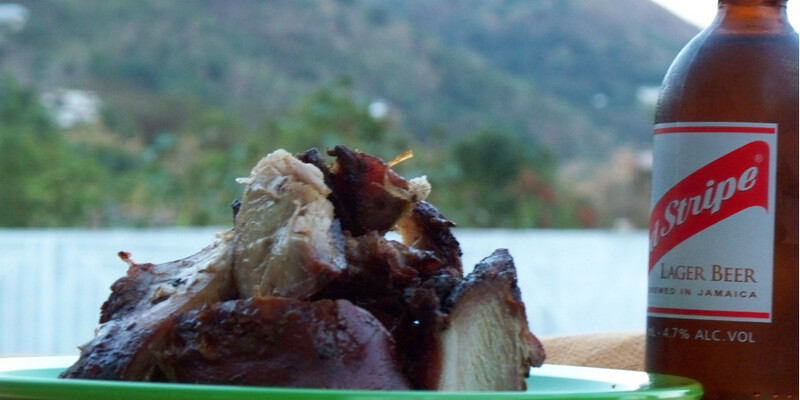 Curried Goat is a Jamaican favourite and a must have on any credible Jamaican food tour. Ask for the ram goat meat! This evening we’ll take on Kingston, dine out at a selection of classy restaurants. Just perfect the art of being a guest, the rest is on us. This morning you’ll leave the Liguanea Plain behind and head for the hills – The Blue Mountains, home of the world famous Blue Mountain Coffee – one of the most expensive and sought after caffeine beverages in the World. The breath-taking elevation offers an experience like no other. 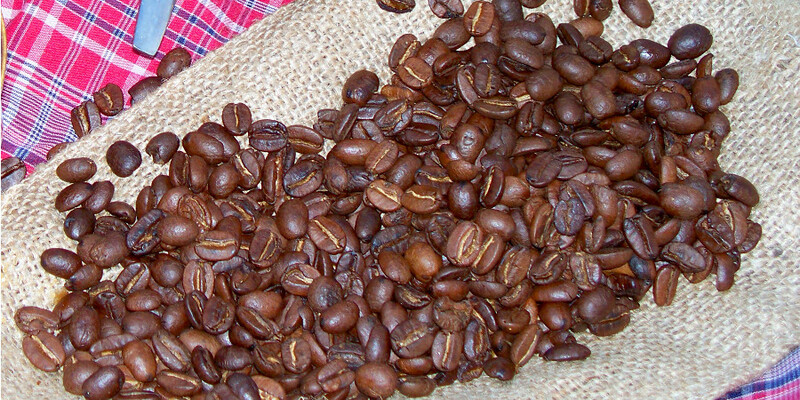 Wrapped in the calming aroma of coffee, tour the property and get your fix of local java. 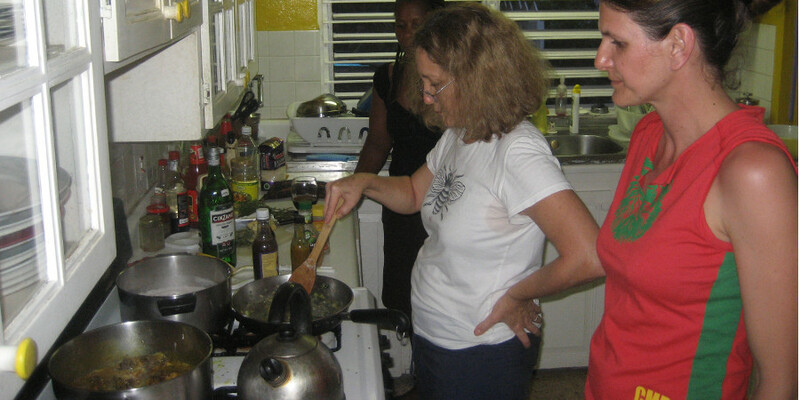 This afternoon you’ll put on your chef’s hat again to be instructed in the preparation of a Jamaican meal and you’ll do so at the home of one of Jamaica Discovery’s welcoming friend. Tie your aprons securely and grab your cooking spoon! 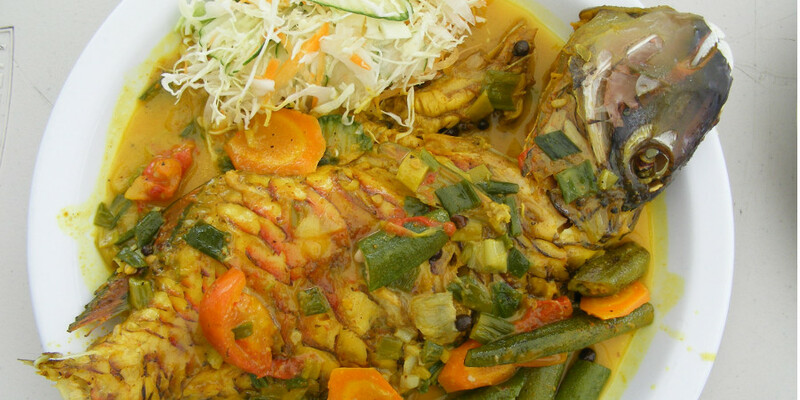 The choices are endless: mackerel/salt fish run-dun, rice and peas, seasoned rice, curried chicken, ackee and salt-fish – Jamaica’s national dish, to name a few. Dinner will be what you’ve prepared so it is guaranteed to be awesome! Cultural crawl around town. Today is reserved for you to explore other areas of interest – the options are many: Bob Marley Museum, former home of Jamaica’s Reggae music Icon, the National Gallery, Port Royal, Lime Cay, Hellshire, Devon House, Jamaican Dance classes, Vintage music tours, etc, etc. 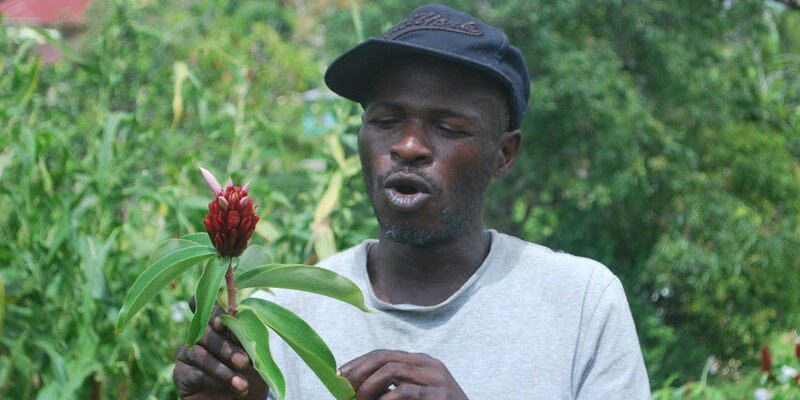 The culture and landscape are rich and diverse…the options are many and your Jamaica Discovery Tour leader will be ever so happy to facilitate. But be back in time for Dinner as tonight’s meal is on us and will be a fine dining experience as the food will be prepared by local “guest” chef of our choosing. Today takes you to the lush, north-eastern end of the island. Portland is the destination, the jerk capital of the World. The Portland Jerk Experience is one your taste buds will remember for a lifetime. Here is where jerking meats have been perfected as Jamaica owns the patent on ‘jerk’. Originally, this was a way of preserving meats: a blend of herbs and spices which when applied, maintained freshness. Today, this indigenous way of cooking involves immersing meats into the same unique rub which marinates and flavours, permeating with a spiciness that pleasantly assails the senses. The meat is then slow cooked over a stoked open pit for just about a minute before you die of anticipation. A cleaver reduces the chunks to delectable bite-sized morsels. We just caught you chewing… This evening’s dining experience takes you no further than your check-in point. Dine in at your Hotel, enjoy the culinary creations of the resident chef. Do a fun Portland activity today…raft down the Rio Grande, visit the Blue Lagoon or Frenchmans Cove or Winifred Beach, or Reich Falls or Somerset Falls or the Nonsuch Caves. Portland is lush and green and un-spoilt. Bask in the sun, suspend time, perfect the art of pleasure. 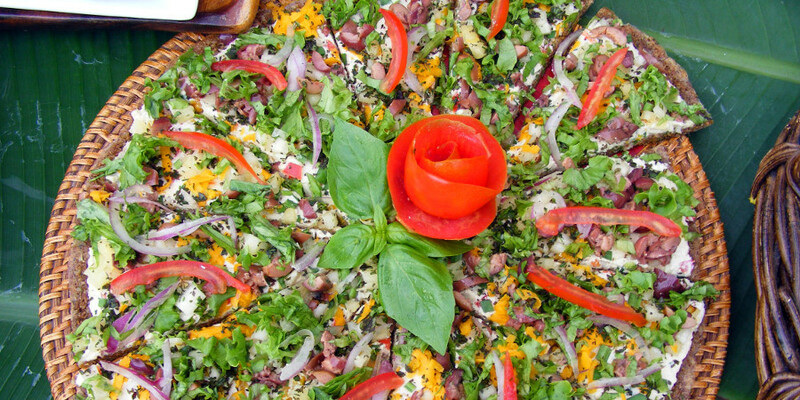 This evening you’ll try Jamaican Raw food cuisine…the flavour profile of Jamaica’s natural ingredients is unmatched and this makes the “Land we Love” a raw food eaters’ paradise. Reserved for winding down and you’ll do so in Ocho Rios. Your journey itself will be a treat. Lush, rolling hillsides, sun-kissed panoramic scenes as we hug the coast line to Ochi. Located on the coast, this dazzling island town offers much to see and do. Here you’ll drop anchor for the next two days and explore the environs. You create the agendas. Do nothing, lazing is perfectly legal here. Or do everything, attempt to, at least. Go craft shopping for the souvenir that will remind you of your time in heaven. Explore the wonder that is Dunn’s River Falls, climb the rocks spurting cascading waters. Let it all hang out at Jimmy Buffet’s Margaritaville, music, dancing, food and fun. Engage in exciting watersports, para-sailing, water-skiing, wind surfing. Work on that glow that will make you the envy of your friends and family on your return home. Hike the tourist trail, watch cruise ships dock and depart, chat with the locals.